Hey party peeps! The hottest movie is now one of the hottest trending party themes! 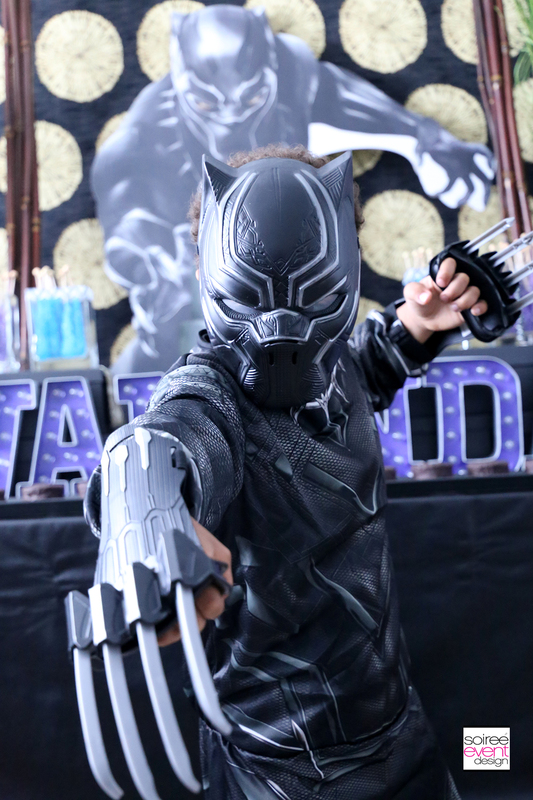 If you are looking for MARVEL BLACK PANTHER PARTY IDEAS check out these ideas including a WAKANDA FOREVER Black Panther Candy Table, and Black Panther party games like Nakia’s DIY Vibranium Ring Toss. Be sure to click over to Oriental Trading Fun 365 to see the entire party I styled along with a shopping list of Black Panter party supplies and more to recreate this yourself! SET THE SCENE! BLACK PANTHER PARTY IDEAS – BLACK PANTHER COSTUMES! There’s no better way to set the scene for an amazing MARVEL Black Panther party than to dress up in Black Panther Costumes! Kids love dressing up as their favorite superhero and running around striking poses. Get your cameras ready for some fun photo opportunities! BLACK PANTHER PARTY IDEAS – BLACK PANTHER CANDY TABLE! Nowadays, a party isn’t complete without an amazing candy table! 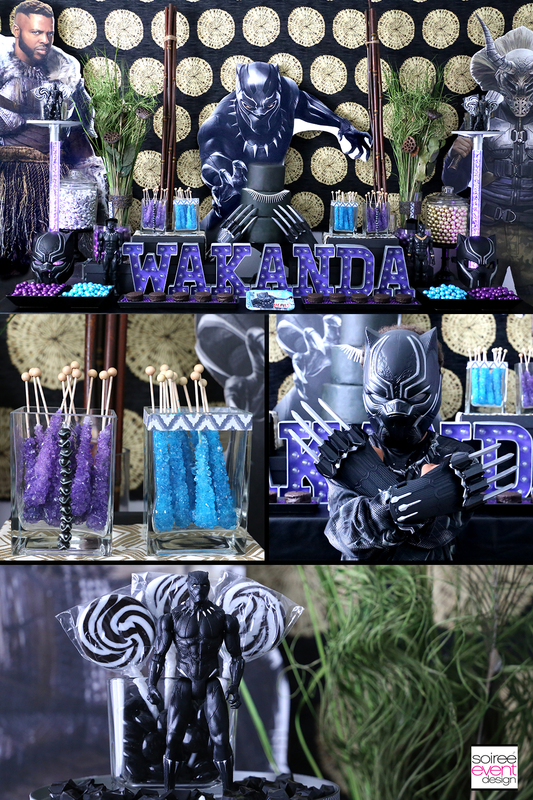 Check out this WAKANDA FOREVER Black Panther Candy Table that includes color-coordinated candy and desserts. The wow-factor? These full-size Black Panther cardboard standups! Oriental Trading has all the Black Panther character standups that will have your guests saying “WOW!” like mine did. Cardboard standups are an easy way to quickly decorate your party space! They set up in literally minutes and are so big that they add such a visual impact to your party without much effort. They also make for great photos as kids love to pose with them. GIRLFRIEND TIP: When designing a Black Panther party, you don’t have to just use the commercial Black Panther party supplies. To give this table a more customized look, I added lots of tribal elements to bring in the feeling of WAKANDA including a tribal print fabric backdrop, bamboo sticks, tropical greenery, tribal jewelry and washi tape to accent the plain glassware! BLACK PANTHER PARTY IDEAS – BLACK PANTHER PARTY GAMES! Keeping your guests busy is key to any successful party! 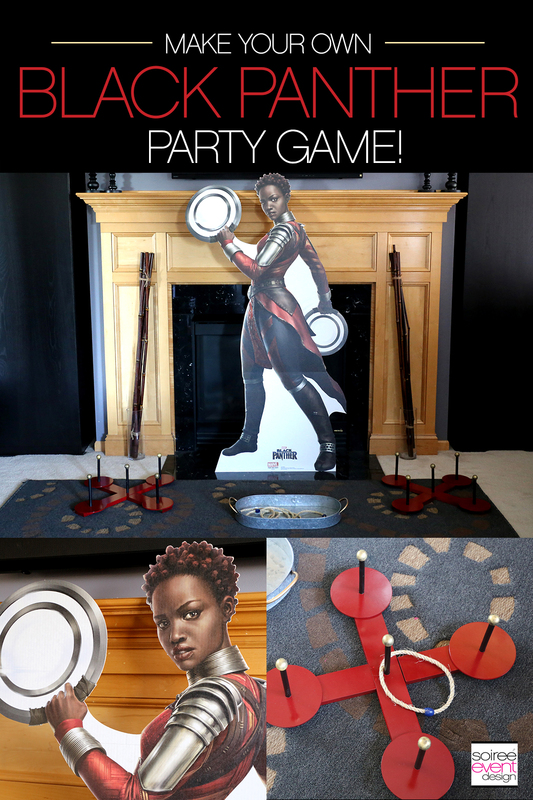 Get creative and create your own Black Panther Party Games based on the characters from the movie like this DIY Nakia Vibranium Ring Toss Game that I customized to match the party theme. Check out the step-by-step tutorial on how to make this yourself along with a shopping list to purchase the supplies. WANT MORE BLACK PANTHER PARTY IDEAS? WANT TO BE A PARTY PLANNER? 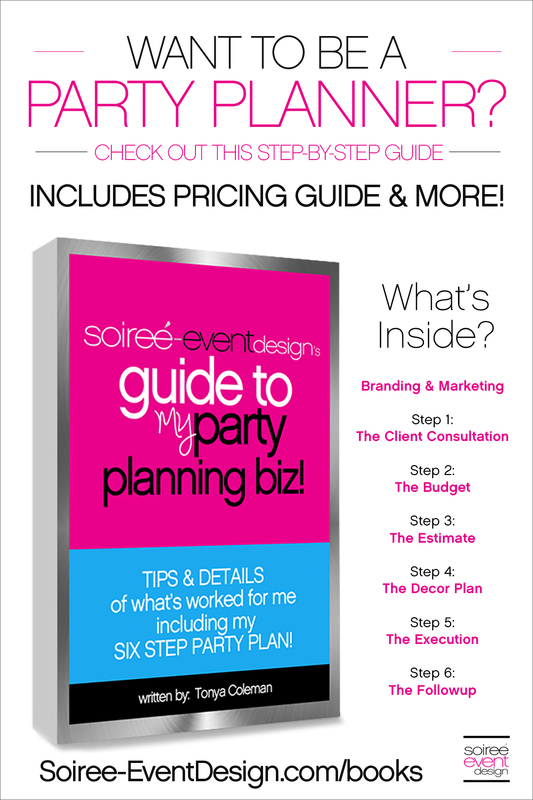 Check out my ebook “Soiree Event Design’s Guide to MY Party Planning Biz!”, affectionately referred to as “The Girlfriend’s Guide to Party Planning” by my friends and colleagues. In the book, I share DETAILS on how I started my party planning business. I’m sharing my successes and yup…my failures! I’m also sharing how much I charge for parties and how I stayed profitable. Told in my voice with lots of Girlfriend Tips throughout! Check out more info on my Guide to MY Party Planning Business Ebook. favorite super hero but his birthday already passed. I am bookmarking this in the event he is still a big fan next year. What a great party idea. I think any kid would LOVE it (and quite a few adults too). Love the tribal elements on the table. Great detail. And those costumes are awesome! I am sure this will be a hot party theme this year! We still have not seen the movie but want to soon. How cool we are not huge into black panther but this is neat for those that are! what a great way to set up a party! I love that you have used Tribal elements to style this party! I can’t wait to see more of your styled events! 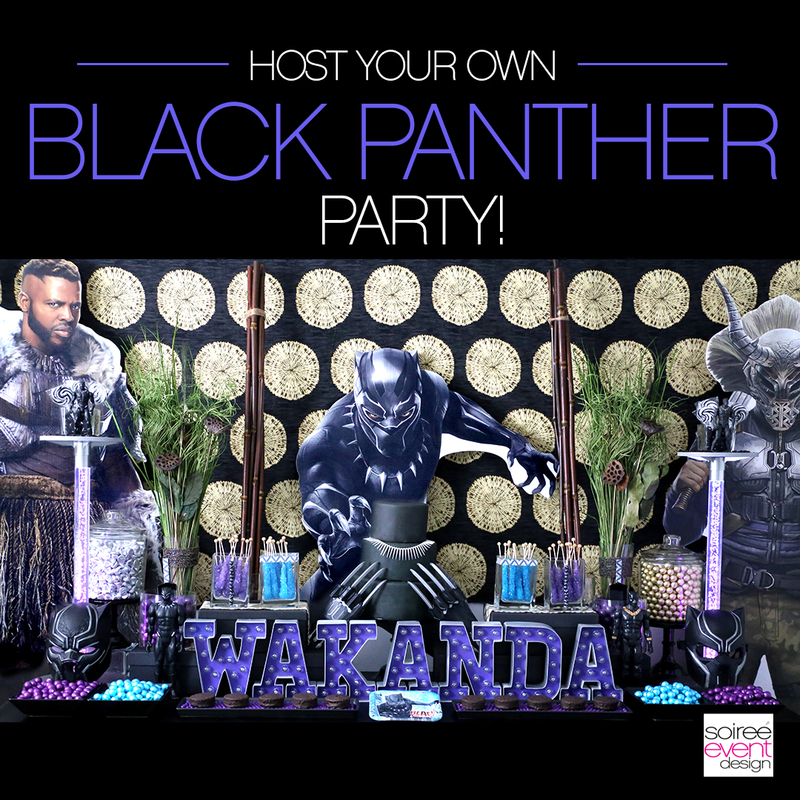 These are awesome ideas to hold a Blank Panther Party! Love your decorations from start to finish. How fun is this!? My friend’s kid is Black Panther obsessed and has a birthday in November. I’m TOTALLY sharing this with her. He will flip out! I am loving the Black Panther party theme. Those character cardboard standups are awesome! I love this so much! My daughter would love to have a Black Panther party. This is AWESOME. Your parties are so amazing and well thought out. I love this one so much as Black Panther is my teen sons fav movie right now. What an awesome party idea! Love all the details and colors! So pretty! These ideas are super amazing! I loved the Black Panther movie, so this would be a go for me! This is such a fun party theme! I especially love the Black Panther candy table. Everything looks totally delicious. I love Black Panther!!!! This looks like a fun party theme! You have very creative ideas!! Love the Idea. Black panther candy table looks awesome. Good to go with this. My son’s birthday is near, this could be a great idea for a surprise party. He likes black panther. OOooh what a fun party idea!!! We haven’t seen Black Panther yet but it looks really good! This will surely drive black panther fans crazy. Your ideas are insanely fun and unique . That’s something every boy (of any age) will love.. Mine is so obsessed with superheroes he would love it. Great idea. Kids will really enjoy this party theme. Thanks for sharing. Brilliant ideas for the Panther themed party… Gonna keep our lil heroes entertained for a while! Yay! Great party theme for boys, love the idea! Wakunda Forever!! Oh how I wish this movie came out when my kids were young. This is a classic that will always have awesome party ideas. Very cool! My kids aren’t old enough to watch it yet, but I’m sure my son will love it in a few years! This is so cute. 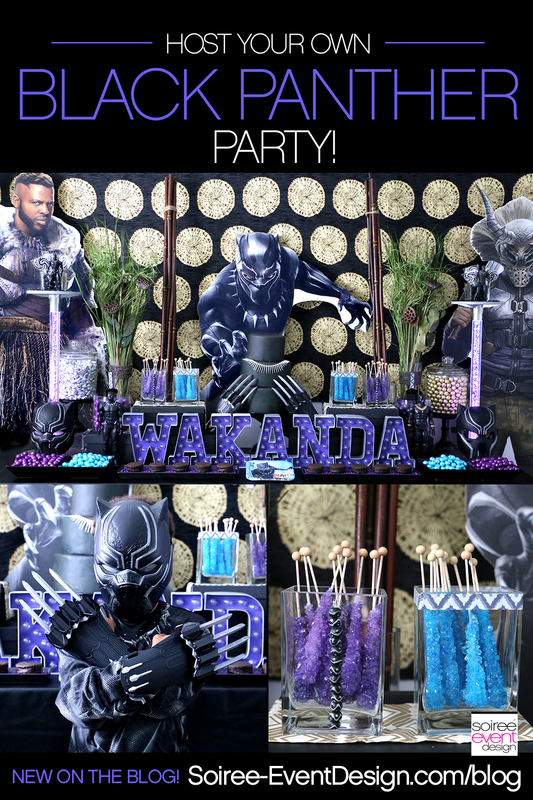 I think any kid would love to have this as a Wakanda theme party so many cute detail. I can see why it would be a pretty popular theme at parties. There are so many different ways you can go with a Black Panther party. And you gotta love the costumes as well. This is a really cool idea! Looks so realistic and fun. I should try this on my birthday. These are the nice and fabulous idea for the black panther party. These are very delicious candies and desert.